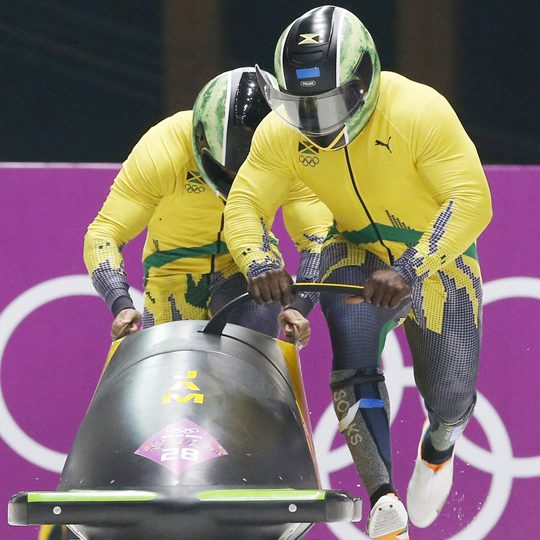 To get to the recent 2014 Winter Olympic Games in Sochi, Russia, the legendary Jamaican bobsled team needed more than just skill, determination and moxie. They also needed money. In decades past, the team made famous in the 1993 Disney film "Cool Runnings" might have turned to local banks or a handful of Caribbean sports enthusiasts to raise the $80,000 necessary to make the journey. But this being the 21st century, they had an even more dynamic instrument at their disposal: Crowdfunding. Using the hashtag #CoolRunnings, the Jamaicans raised nearly $30,000 on Dogecoin's website, $80,000 on Crowdtilt and another $16,000-plus on Indiegogo. In all, the team raised nearly $130,000 via these and other online crowdfunding platforms. The Jamaican bobsledders are hardly the only group to successfully use crowdfunding in recent years. Last year, Hollywood writer/producer Rob Thomas famously used Kickstarter to raise more than $5 million to finance the feature film incarnation of his 2004-2007 TV series Veronica Mars. (The film version is scheduled to hit theaters and video-on-demand March 14.) Another example includes researchers at the MIT Media Lab who used crowdfunding to get the $100,000 they needed to fund their FORM1 home 3D printer. Actual pledges totaled more than $3 million. However, that doesn’t compare to the $10 million the creators of the Pebble E-Paper watch raised from 70,000 individual backers on Kickstarter. Their original goal? A mere $100,000. So just what is crowdfunding? What makes a venture crowdfund-able? What benefits does it offer compared to conventional capital sources? Is crowdfunding right for your business? And could it be just another passing fad? "Crowdfunding provides a promising alternative for new businesses seeking capital," said Karlene Sinclair-Robinson (@KarleneSinRob), private business consultant and author of the book Spank the Bank: THE Guide to Alternative Business Financing (Outskirts Press, 2013). "It provides benefits to both the entrepreneur and the investor unavailable through traditional funding sources." Crowdfunding -- also called crowd financing, crowd equity or crowdsource funding -- involves raising capital for a particular project via small contributions from hundreds or even thousands of individual participants. The concept has been around since the 17th century, when it was used to raise money for early book printings, but it took the Internet to make it a viable, worldwide phenomenon. Crowdfunding websites started to appear in the early 2000s, but it wasn’t until Kickstarter launched in 2009 in response to the Great Recession, that these types of websites became more mainstream. To put it into context, about $5 billion were raised via crowdfunding in 2013 alone, according to CNN. That's almost double the $2.7 billion raised in 2012. There are literally hundreds of crowdfunding websites now online, according to Sinclair-Robinson. "Some sites are strictly local. Some are regional. And some are national. If you're planning to crowdfund -- or invest in a crowdfunded project -- you need to pick the platform that best suits your needs." When it comes to crowdfunding, products are much better than services, Sinclair-Robinson advises. "People want to invest in something they can see or touch," she explained. "If you're trying to launch a service, perhaps you fund it by selling a book related to your venture." What makes crowdfunding so attractive to businesses? No need for a formal business plan. Unlike banks or the Small Business Administration, crowdfunding sites don't require you to create a traditional business plan. A good product description or prototype is all that's required. You also need a solid marketing video, which is currently required for most serious crowdfunding ventures. It's a powerful marketing tool. A crowdfunding site doesn't just solicit investors; it also serves as a free marketing platform that enables you to introduce your product to a national audience. It provides proof-of-concept. Perhaps the most useful feature of crowdfunding is that it provides a fast and clear answer to any entrepreneur's most fundamental question: Will this product sell? If people invest en mass, then the answer would appear to be "Yes." If funding can't be achieved, well, then perhaps it's time to go back to the drawing board. It allows for instant customer feedback. Crowdfunding allows "the wisdom of crowds" to come into play by allowing customers to share ideas with you and fellow investors. It's a way to conduct a focus-group for a proposed product using a much larger number of eager -- and often quite passionate -- participants. You can pre-sell a product. In many cases, crowdfunding participants aren't traditional investors looking for a return, they're customers ready to pay in advance for a product they want. The advantage to crowdfunding is that if the necessary capital threshold is not reached, no actual cash is exchanged. So the risks on both sides of the equation are minimal. "For investors, crowdfunding represents a great way to mitigate risk," Sinclair-Robinson noted. "By spreading out small investments over a large number of projects, you significantly lower the risks associated with putting all your proverbial eggs in a single basket." Be honest. "Be completely above-board about what your product is intended to do, how it's made, and the benefits it's designed to deliver. There's nothing to be gained from overhyping what you intend to produce," she noted. Only ask for what you need. "The lower your initial request, the more likely you are to get funded," she said. "If you raise more money than you absolutely need, that's great. But never count on it." Make sure all your Web links work. "If you're linking to your company's home page or other related sites, please make sure all the links operate properly," she said. "There's nothing worse than a fund-raising site with broken links." Always offer something in return. The key to crowdfunding is to offer "extras" above and beyond the product itself, the value of the bonuses linked to the size of the contribution. "It's common for entrepreneurs to offer pens, T-shirts, books or other 'swag' to entice investors. In the world of crowdsourcing, you always have to give something to get something." Despite being relatively new on the capital-raising scene, crowdfunding is likely here to stay, according to Sinclair-Robinson. "No way we're going back to the good old days," she said. "We're going to see a lot more growth and development in this realm. It's all about people helping people."